You’ve heard of horse whisperers, dog whisperers, and I’m sure even a few others I haven’t heard of myself. I once even consulted a snake whisperer, after some unruly behavior from a rather large pet snake I once owned. Yes, and even I thought that was bizarre—just as you are, no doubt, thinking the same thing. However, one thing I’m sure you’ve yet to hear about is a zombie whisperer. Yes, you read that right—a zombie whisperer! Possibly, in this case, stranger things have indeed not happened before. 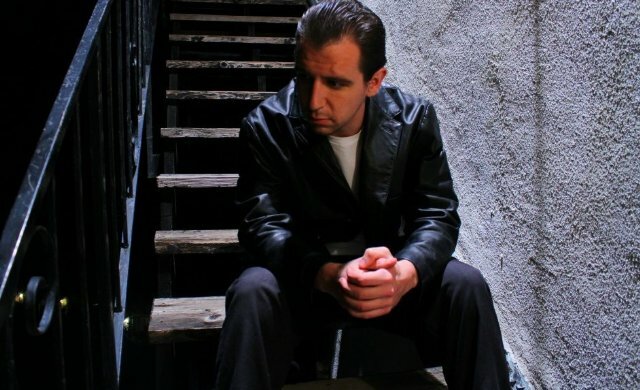 Zombie Whisperer is a new reality-TV web series starring Matt Fowler as Tony Mallone—the tough but calm, streetwise soother of the restless undead. Yes, if a brain-eating member of your family ever causes a problem (as if that wouldn’t happen), there’s no other man for the job. Making your dangerous dead once again docile and domestic is just a call away. No zombie is too undead for Tony! I don’t know his number off hand; I misplaced in somewhere in all the excitement. However, one thing’s for sure—it’s not a 555 number. Tony Mollone plays his part for real! I started to call this a mock-reality TV show, but, with all the zombie sightings lately who knows? Episode 1 of Zombie Whisperer begins with a viewer warning: “Do not attempt the techniques you are about to see without consultin’ a professional!” (Yes, the “g” in consulting is also ellipted in the text, exactly as the southern-accented narrator says it.) After the show’s opening montage, Tony Mallone is introduced as “world-renowned expert and original creator of PETZ” (People for the Ethical Treatment of Zombies). Tony then approaches the front door of his next zombie owner in distress—Tammy (Lacy Hornick). Tammy is a giddy, 20ish woman seemingly more enamored with meeting Tony than she is disturbed by her zombie problem. However, in true professional form, Tony wants to “get right to it”—right to solving the zombie problem that is. Bob (Kyle Duncan Graham) is Tammy’s pet zombie she found digging through her garbage one day, before taking him in as her pet. Tammy has “a soft spot for zombies.” Bob has since become “out of control”, causing, you guessed it, the need for Tony Mallone! “You must become what you hope to control,” says Tony. Speaking of the “zombie-digging through the garbage” detail, this is nice touch you may feel as well. Some zombies it seems, except for the wild ones, have become domesticated like dogs, incapable of living on their own. Instead of being self-sufficient brain eaters, they forage for food, also living off the refuse of people rather than the brains of the people themselves. In the event that some domestic types regress to their stereotypic habits, again Tony Mallone is only a phone call away. Tony can, no doubt, tame a completely wild zombie as well. Yes, I have no doubt. Although I care little for reality TV, I have a great love for mock-reality TV! I guess you could say that I really love seeing something I don’t care much for mocked to the point of being humorous. At least it then becomes useful for something. The Zombie Whisperer is just the type of mock-reality TV that I love. Everyone plays the part as seriously as you’d expect such a thing to be done in real life. Out of control zombies would have their ironic share of humor anyway—once the novelty of it all wore off. Yes, I think even household zombie problems might become old hat and halfway ignored soon enough. “My zombie’s been acting up. I may need to call a zombie whisperer next week.” You know how people are. So, as a humorous but true social statement (yes, there is some intelligent stuff here), Zombie Whisperer tells its story to make us think, while making us laugh at the same time. However, since brains are always in short supply around zombies, you won’t have to think too much. Lacy Hornick (as Tammy) gets my award for the short film actress most qualified for a job on Saturday Night Live. Lacy (who I have not seen previously) is an actress I’d really like to see again. As I said, she does just the perfect sort of exaggerated, faux-serious character acting that helps make this episode of Zombie Whisperer work so well. Playing this part too seriously wouldn’t have worked as well, but Lacy nails it, just as it’s needed. Again, I will look for Lacy in the future; with such performances, I’m sure she’ll show up often. What can I say about Kyle Duncan Graham as Bob the zombie? Is he just another token, undead corpse in a very alive web series episode? NO! (Notice that I capitalized the “N” and the “O” in that answer.”) In a series like Zombie Whisperer, a standout performance as a zombie is key. Without a good zombie, such a show could fall flat. No fear here! Kyle (as Bob) is a zombie to remember, in as much as zombies can be remembered. His zombie growls are as authentic as any I’ve heard; when he reaches out for you with those bloody, undead zombie hands, he means it! Get out of the way, and cover your skullcap! Yes, it would be easy for zombies to be forgotten altogether in such reviews; it happens all the time. How often do zombies get credit where it’s due for their undead talents? Rarely ever! But here, in this review, Kyle Duncan Graham as Bob gets a special place to be remembered. After all, zombies were once people too. What is the zombie’s problem? How does the amazing Tony Mallone solve the problem? Does anyone get killed in the process? What is Tony Mallone’s “groundbreaking technique”? Is Tammy a happy, satisfied customer in the end, who will recommend Tony to all her friends? What happens to Bob the zombie? Those are all really good questions; but, if I answered all of that, you wouldn’t have to watch Zombie Whisperer, would you? No, you wouldn’t. And I’d be the last to cause any zombie-loving watcher of such zombie shows to find cause to skip this one. 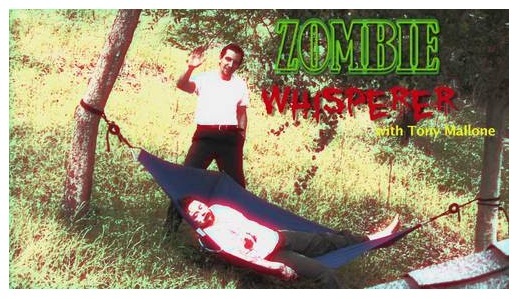 So, make sure to catch Zombie Whisperer on www.funnyordie.com. Funny or Die a website that allows viewers to watch a feature show and then vote it “funny” or “die” (as in, I suppose, dying a very unfunny death.) I am happy to report that I voted “funny” for The Zombie Whisperer. After all, I guess it’s only appropriate that a zombie show doesn’t die. That just wouldn’t be right! The Zombie Whisperer is a new and (as you can already tell) very original web series. It’s created by Matt Fowler and Kelsey Boutte and also directed by Matt Fowler. Makeup and special effects are also done by Kelsey Boutte. Without the need to mention it (although I will anyway), Matt Fowler and Kelsey Boutte have created a series that truly stands out in the lineup of other shows I’ve seen. It gets my highest recommendations! I actually liked Zombie Whisperer so much that I plan to feature episodes right here on Space Jockey Reviews. New episodes will be posted when available. However, you’re in luck! The first episode I’ve reviewed here is posted below! Tony Mallone himself (Matt Fowler, of course) informed me that the second episode (and possibly the third) will be filmed in the first week of September and available to the public by the third week. In the meantime, check out the first episode below! (Viewer discretion is advised!) Oh, and if you have any zombie control problems, you know who to call—the name is Tony Mallone!